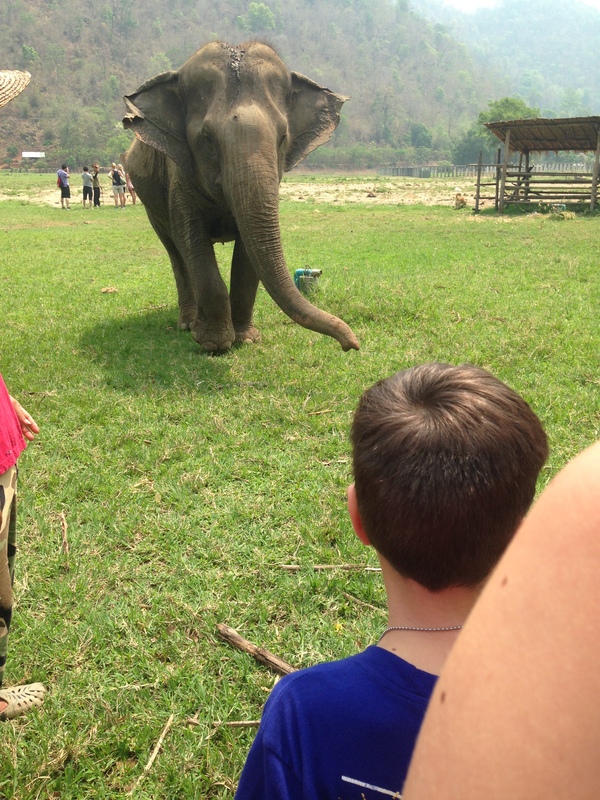 One of the big must-do’s in Chiang Mai was to head out to the Elephant Nature Park. We originally had wanted to do an overnight trip but ultimately decided to stick to a one day event. This park is one of three in Thailand who’s major goal is to save and rehabilitate abused and abandoned Asian Elephants in Northern Thailand. There are believed to be only 30,000 of them left in the world. The story behind this park and its owner is a beautiful and heart wrenching one. If you’re interested, you can read more about Lek and the park here. 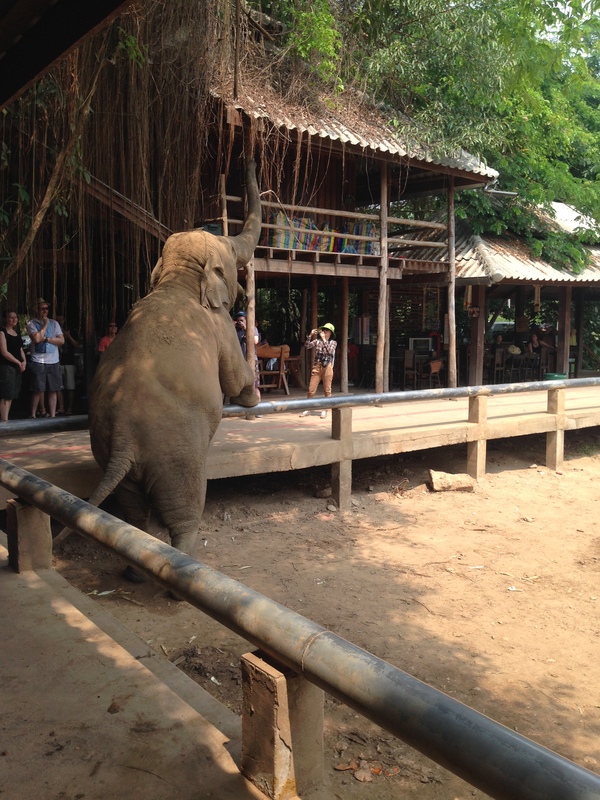 This is not a typical elephant experience where you can watch them paint pictures, do tricks, and take rides. 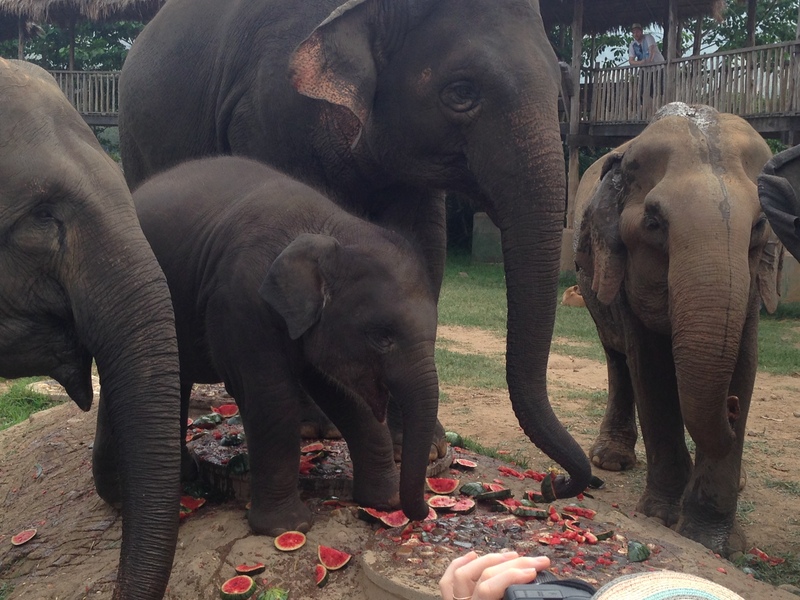 The goal of this park is to allow the elephants to live like elephants. The point of the tour is to give the park an income and to expose us to proper and humane treatment of an animal that is on it’s way to extinction. I think we were told that it takes in the neighborhood of WAY TOO MUCH to run this park and they rely on donations, tours, sponsorships, volunteers and proceeds from online sales. I am very glad that we chose to go to this park. The care that they take of their animals showed in each one of them. There are no bullhooks and tricks being done. 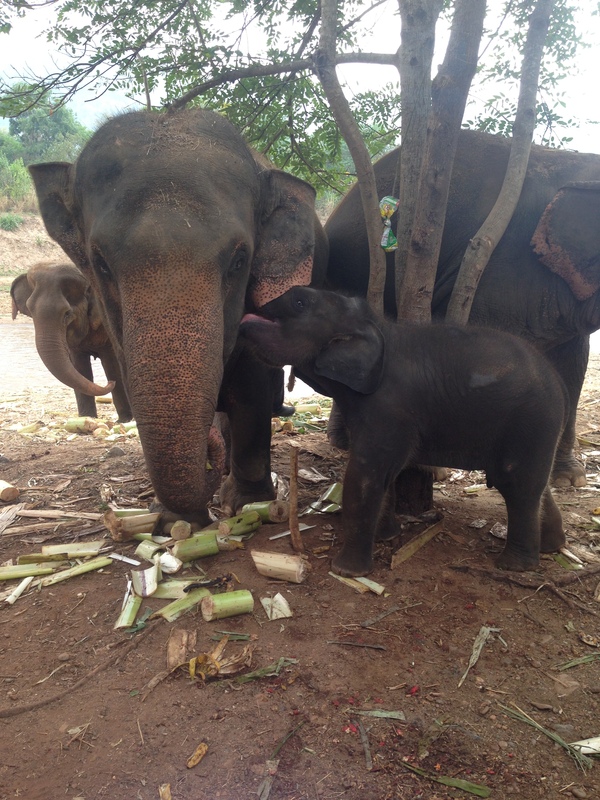 There is a loving caretaker for each elephant that has been with the park for at least a year. 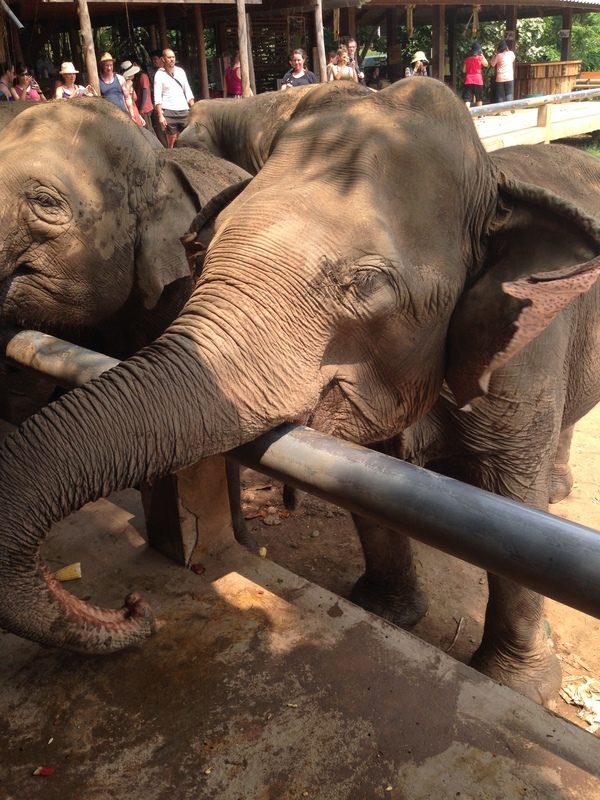 The elephants are fed at specific times, catering to their individual needs, and are given treatment and care that most had been missing their whole lives. This old lady…who’s about 70 years old, is fed a specific diet that consists of peeled fruits and veggies. She is unable to digest the husks/peels/rinds and her caretaker lovingly prepares her food every day. ~FYI, the metal fence is there so they don’t do this…. When we got there, after being briefed about the rules and expectations, we fed them and then were allowed to walk out into the field (under close supervision) to interact with them as they meander around. However, it was noon. It was hot. Guess what Grace did? Yep. She passed out. Poor kid. I’m guessing since she did it before that she might be a tad sensitive to heat. 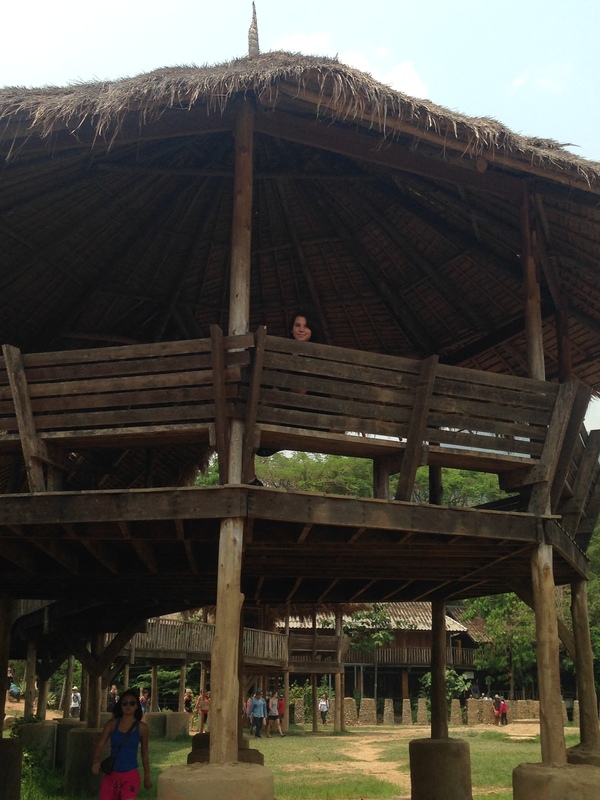 So, after being carried into the pavilion and soaked with water and ice (and drinking enough to make her pee for three days straight) she had to spend the majority of her time here…. But at least she was cool and still was able to watch what was going on. 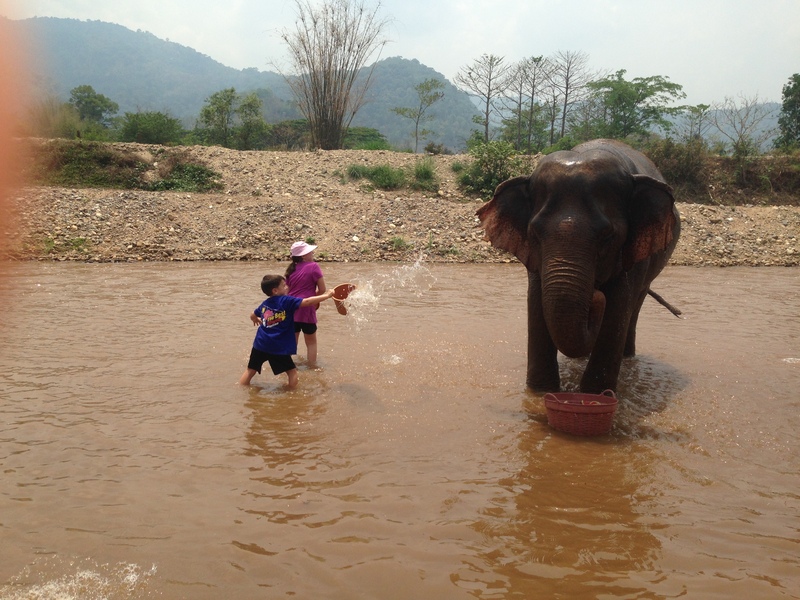 The kids got to go into the river to help “bathe” the elephants….this really consisted of them pouring (throwing) buckets of water on the elephants while they had a snack. 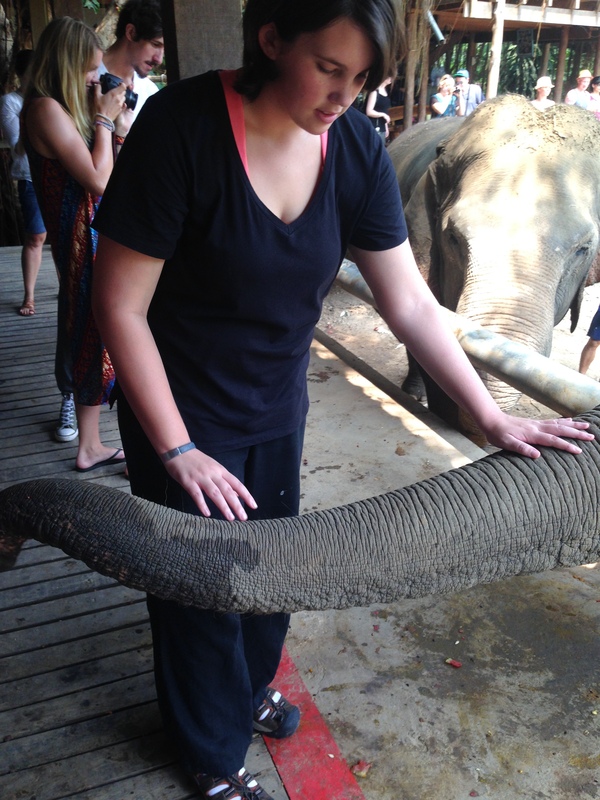 The caretakers said that this ensured the elephants didn’t get overheated. And the ones that typically had this done to them by the tourists were the elephants who were older and tended to roam without a family pack. The ones that had families were left to care for each other as they would in the wild. In essence, we were her family for that afternoon! 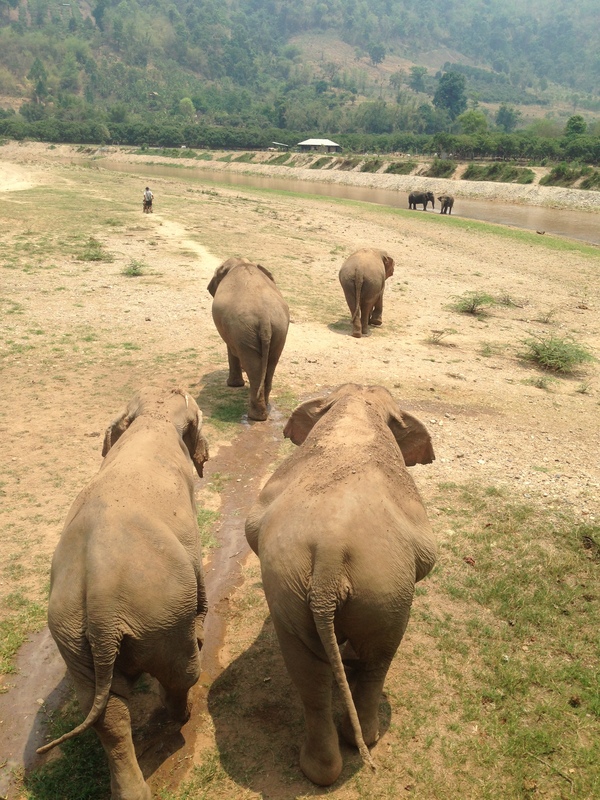 Here’s a picture of one of the families walking over to the river to cool off…. There was one elephant family that had a baby elephant. She was born in the park and was very protected…not only by her mothers but by the staff as well. (yes i used plural for mom….babies are mothered by all females in the family) This little cutie pie was not allowed to be touched…only photographed as she played with her momma while snacking!